Overview - It is the year 2029: Astronaut Leo Davidson (Mark Wahlberg) boards a pod cruiser on a Space Station for a "routine" reconnaissance mission. But an aburupt detour through a space time wormhole lands him on a strange planet where talking apes rule over the human race. With the help of a sympathetic chimpanzee activist named Ari (Helena Bonham-Carter) and a small band of human rebels, Leo leads the effort to evade the advancing Gorilla Army led by General Thade (Tim Roth) and his most trusted warrior Attar (Michael Clarke Duncan). Now the race is on to reach a sacred temple within the planet's Forbidden Zone to discover the shocking secrets of mankind's past - and the key to its future. Like many other film buffs, I was excited when I first heard that Tim Burton was "reimagining" the sci-fi classic 'Planet of the Apes.' It seemed like such a natural -- a visionary director, cutting-edge special effects, a timeless story oozing possibilities for an update. What could go wrong? Turns out, just about everything. Though it opened huge at the box office, 'Apes' 2001-style turned into one of the year's biggest disappointments. It's hard to pinpoint exactly what went wrong. The film looks good; the ape effects are fantastic; the seemingly fool-proof plot of the original has been more or less retained; and the cast is first-rate. Yet Buron's 'Apes' just doesn't gel. Even watching the film again for the first time in over six years, I'm left with the same hollow, empty feeling. Even the all-new "surprise" ending pales in comparison with the fantastic conclusion to the original. Based on Pierre Boulle's long-forgotten original novella "Monkey Planet," the 1968 version of 'Planet of the Apes' was the rare "B-movie" to elevate the genre with its intelligent premise, and a script as flush with action as it was challenging questions about race and culture. Granted, it wasn't always subtle, but 'Apes' has unquestionably earned its place in the pop culture lexicon because it dared to be about something. Flashforward to 2001, and Burton, working off of William ('Cast Away,' 'Flags of our Fathers') Broyles' script, retains the basic setup while tweaking some the details. Our intrepid hero Captain Leo Davidson (Mark Wahlberg) defies orders and leaves his damaged space station in search of a wayward chimp when an experiment goes awry (don't keep Marky away from his monkey!). After a crash landing, he ends up on some sort of parallel planet, where the apes are in charge and the humans are bartered slaves. With the help of the sympathetic female primate Ari (Helena Bonham Carter), Leo leads a human uprising against the apes, taking on the violent Thade (Tim Roth) and his henchman Attar (Michael Clarke Duncan). As a full-on civil war erupts, Leo will discover many secrets on this planet of the apes, including a link to human civilization that could rewrite the future of civilization. 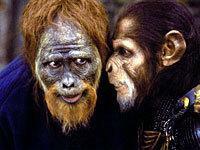 Burton spoke a great deal at the time of 'Apes' release about wanting to explore the "duality" between ape and man inherent in the source material. But what I found lacking in his approach was any sort of modern context. In the '60s, as America was battling in its streets over civil rights, the material was incendiary in and of itself. To bring that same sense of urgency and drama to the remake, Burton and Broyles needed to mine the story for more topical thematic threads, bring them out, and exploit them to the hilt. Alas, that just didn't happen. Aside from astounding new ape make-ups from Rick Baker, little better or more inventive than the material appears to have emerged. Even Burton's usual fantastical visual style is hardly in evidence. Aside from some interesting matte shots and nice sets, his visual panache and originality (see 'Beetlejuice,' 'Batman Returns' and 'Sleepy Hollow') has been replaced with a bland, generic vision of the future. And believe what you've heard about the now-infamous "surprise" ending. 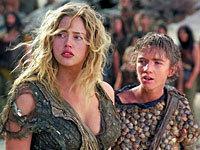 Where the original was a masterstroke that totally threw everything that went before it into a whole new perspective, the remake's coda smacks of desperation, a tacked-on attempt to set up a sequel with nary a nod towards plausibility or common sense. To be fair, 'Apes' can still be a lot of fun if you temper your expectations. While Wahlberg delivers what is likely his worst performance ever as a lead actor, Bonham Carter easily makes up the difference, creating the only three-dimensional character in the film (and under layers of latex, no less). I also liked Roth, all aggression as Thade, and Paul Giamatti so immerses himself in the ape world that even his distinctive mannerisms are unrecognizable. I also enjoyed Burton's respect for the culture and customs of the primate world, particularly the playful sequence about mid-way through the film where Wahlberg crashes through a series of gags of apes going about their daily routines. And while sequences like this hint at what might have been,this re-imagining of 'Planet of the Apes' somehow becomes just another assembly-line action flick. A little less action, better characters and a whole heap more relevance would have done the trick. It's really too bad. 'Planet of the Apes' hits Blu-ray with some high expectations. Even though the film itself is not very highly regarded, the standard-def DVD release was considered one of the finest presentations ever to hit the format, and the previous D-VHS high-def release also generated high marks. Unfortunately, I'm slightly disappointed with the results of this Blu-ray presentation. Make no mistake, this 1080p/MPEG-2 transfer generally looks quite good, with all the major building blocks in place. The master still holds up, with a pristine veneer that's free of any defects, dirt, or inconsistent film grain. I also liked the rich cinematography, which uses lush jungle greens as a backdrop, and bold reds and blues in the costumes and art direction. 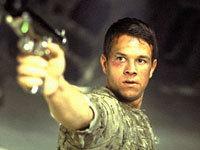 (Only the opening "Marky Mark on a spaceship" sequence suffers from all-white bland sets that look like rejects from '2001.') Compression issues aren't a problem, with no noticeable posterization or banding, nor macroblocking. Oddly, what keeps 'Apes' from hitting a five-star home run on Blu-ray is that it only really excels in its darker scenes. All daylight exteriors have a funky polarized look to them, as if the mid-range of the contrast has been flattened out. It's not severe, but strange enough that the image never quite delivers the three-dimensional kind of "Holy crap!" reaction I anticipated. Dark scenes (about sixty percent of the movie) really pop, with improved depth and fine detail visible vs earlier standard-def editions, from the individual hairs on the apes to the ornate costume design. The outdoor scenes, meanwhile, seem to have some color filtering, which dulls depth. I was also underwhelmed by the opening spaceship sequence, before Wahlberg crash lands on the planet. These scenes are noticeably softer than the rest of the film; though perhaps that was the stylistic intention. In any case, 'Apes' looks very good for much of its runtime - just not all of it. Leaving no room for disappointment is the DTS HD Lossless Master Audio 5.1 surround track. Even with only the 1.5mbps DTS core accessible with current Blu-ray hardware, it holds up strongly with even the best Dolby TrueHD tracks I've heard. The film's sound design also doesn't seem to have aged a day over the past six years. Nothing beats the thrill of apes snarling at you in high-resolution audio. The soundtrack to 'Planet of the Apes' is very percussive, from Danny Elfman's driving score to the heavy pitter-patter of giant monkey feet. Fidelity here is top-notch, from the incredibly tight low-bass to the powerhouse upper range that gives the track a genuine richness and heft. The film's sound design team are the real stars of this show, with the majority of the film's ape and animal sounds constructed in the studio. Not a single effect ever once felt fake, with a realism to the timbre and cadence of sounds that is terrific. Surround use can be very aggressive; Mark Walhberg's crash landing is the first stunner of a sequence, with both pronounced discrete effects and subtle ambiance excellent. Elfman's score is also nicely deployed to all channels, and the result is quite immersive. All of the film's battle sequences also excel, with the "flying apes" accompanied by nice whooshes all around the soundfield. This is the kind of soundtrack meant to be played loud -- awesome stuff. At the time of its first DVD release, 'Planet of the Apes' was the kind of uber-packed two-disc set that defined state-of-the-art for the standard-def format. Unfortunately, Blu-ray fans will not get to revel in that nostalgia, as Fox has dropped all but two of those bonus features. The screen-specific audio commentary by director Tim Burton is really quite good. Burton is always a very fascinating guy, especially with his stammered half-sentences and intriguing perspective on narrative and thematics. His insights into 'Apes' are interesting and entertaining, from taking on the film to explore the "duality" of its human/ape characters and reimagining the now-dated future-world seen in the '60s version, to the challenges of the extensive prosthetics and a hilarious non-explanation of the film's crappy ending. Not surprisingly, the track doesn't include any mention of Burton's now-infamous feud with Fox during the production of the film, which ultimately led the acclaimed director publicly state that he "would never work with" the studio again. Still, this is a very, very good production track. The only other extra is the film's Theatrical Trailer in full 1080p, plus promos for a few other Fox Blu-ray titles. 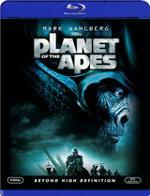 Taken on its own terms, 'Planet of the Apes' is an enjoyable enough sci-fi yarn. As a star director's re-imagining of a much-beloved classic film, however, it can only be described as a major disappointment. This Blu-ray release is serviceable. The transfer is generally good, but disappoints in the brighter exteriors, which look flat. The slimmed-down extras also lay a big ape egg. Only the excellent DTS HD track delivers all that I had hoped. 'Apes' still makes fine demo material, but I'm sorry to say it's not the absolute top-tier release we early adopters were hoping for.